March already? Where does the bloody time go? GCHQ v.2 currently rocks to the sounds of hiphop and dubstep (for CM and FM respectively). On the hiphop tip we've decided to avoid the whole T Pain autotune abuse as with any luck it'll be all old news soon enough -beats and synthy loops are enough to be getting on with. Deadlines are tight this month so no time off for a couple of weeks, which is a bit crap but not that unusual round these parts. 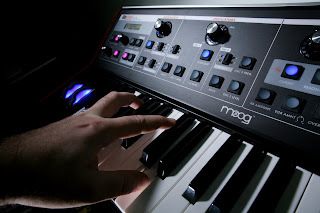 Mr Hoodee managed to get out of having his ugly mug in our bi-monthly photo shoot for FM, instead we went for a shapely hand and moog combo - nice! In other news we've been working on some beats for a forth-coming Sample Magic project and are still giving our Wii a thorough thrashing. On the playlists are the retro soul/funk sounds of Sharon Jones and The Dapkings and The Haggis Horns.